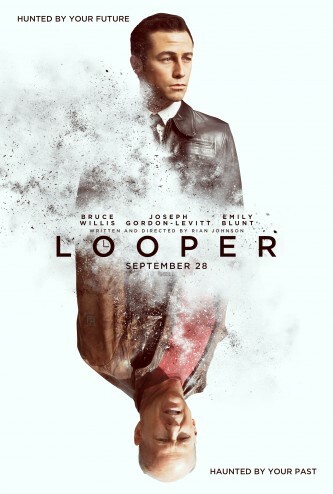 Despite the hype and the praise that the world offered Looper upon its release, something about the concept behind the movie didn’t sit well with me. It was as if I had seen the movie before even though I only took in the trailers. As the praise continued to mount, people talked about how much Bruce Willis and Joseph Gordon-Levitt complimented each other as the younger and older versions of the same character. Others latched on to how Looper was a refreshingly original piece of storytelling. Now, having seen the movie, I think that claim to originality, and my expectation of originality, is what disappoints me the most about this movie. Part of the problem is that the word ‘original’ now seems to have two meanings. I expect original to mean “a new idea”. In terms of Hollywood movies, original simply means, “not part of an existing franchise.” Whether or not the idea is influenced by, or wholesale derivative of, another movie is absolutely independent of if the movie is deemed original. I’m sure you can see where I’m going with all of this. Looper is Terminator without the cyborgs. There, I’ve said it, and the bell can’t be unrung. The only thing the movie needs to be Terminator is for Bruce Willis as “Old Joe” to trade his tragic backstory for a titanium endo-skeleton. Despite all the world-building, which is so much more interesting than anything that actually happens within the plot, Looper’s story gets distilled down to same secret sauce that drove Terminator. There’s a kid, and this kid has a special destiny. The kid is also a telekinetic, but that doesn’t really count for much until the end of the second act. Old Joe wants to kill the kid because the little psycho will grow up to become a mob boss and thus lead to the death of Old Joe’s wife. Young Joe wants to protect the kid because he’s falling in love with the lad’s mother, who is also a telekinetic, but that doesn’t really matter at all. Where Terminator brought forth the terror of a machine that wouldn’t stop until it completed its task, Looper offers an appeal to the audience’s emotion, asking us to decide which of the Joes is more righteous. The problem is that I don’t care for either of the characters or their maudlin stories. Bruce Willis plays his generic tough guy, and Joseph Gordon-Levitt’s character seems ripped from Cosmopolis, absent limos and money. Whenever Mr. Gordon-Levitt squints his eyes and squares his jaw in an attempt to channel the essential Willis machismo, all I can see is a bad impression of French Stewart. The odd thing is that I know both of these actors are capable of delivering more than what they do in Looper. Yet the writing seems to get them hung up on the process of aping each other, rather than telling the audience a story. What really disappointed me about Looper is that writer-director Rian Johnson manages to offer a thought provoking vision of the not-too-distant future, but said vision has almost no bearing on the story itself. Take away time travel and loopers as McGuffins, and there is still a richly crafted, decaying world, endemic with violence, urban poverty, social decay, second amendment reducto ad absurdum, and flying motorcycles. All of it, up to and including the flying motorcycles – which even within the context of the movie are looked at as a goofy fad – are begging for exploration. Lamentably, they are used as little more than fodder for propelling a mediocre time travel story. I want to like the movie if only because the setting is masterfully forged, but the plot is just so over the top and poorly paced that it drags the rest of the movie firmly into the realm of mediocrity. And that is where I land on Looper. Notwithstanding whatever definition of originality a person cares to invoke, Looper, like so many “original” genre movies of late, is nothing more than average. Granted, amid a field of truly terrible movies, it’s easy to mistake average for good. Be that as it may, Looper had the potential to be great if it would have focused a bit more on the world in which it is set, and a little less on the Gordon-Levitt:Willis dichotomy.